Heat oven to 375°F. Spray 13x9-inch (3-quart) baking dish with cooking spray. 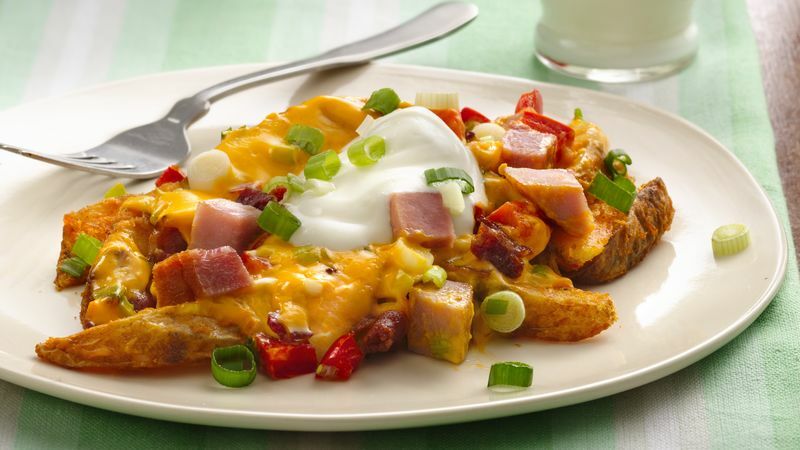 Arrange potato wedges in baking dish; bake 10 to 15 minutes or until thawed and beginning to brown. Top with half each of the ham, bacon, bell pepper and green onions. Spread cheese dip on top. Sprinkle with remaining ham, bacon and bell pepper. Bake 20 to 30 minutes or until cheese dip is melted and potatoes are tender. Top with dollops of sour cream and remaining green onions. For a loaded side dish, omit the ham. Serve with steaks or chops. Substitute grilled chicken strips for the ham.